This bloke is added to Nine’s schedule during the Olympics. It screens at 8:00pm Tuesday August 12 following a repeat of Two and a Half Men. The show chronicles Duane “Dog” Chapman’s operations at his job, Da Kine Bail Bonds in Honolulu, Hawaii and features his family. Nine also has a special, The Man who Lives with Bears at 7:30pm Monday August 11. Featuring some of the most intimate footage of wild bears even seem, follow one man’s secret relationship with both Black and Grizzly bears in the Alaskan wilderness, as he attempts to prove that man and wild bear can live together in harmony. 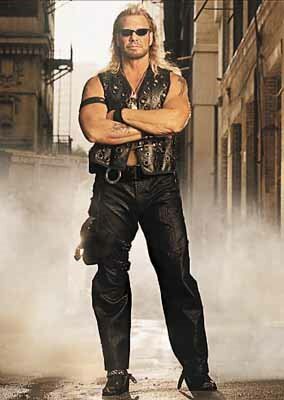 We join the wild and dangerous life of Duane Dog Chapman, a bounty hunter keeping the streets safe in Hawaii. We learn the story of how Dog and how a prison sentence changed his life. Why isnt dogThe Bounty Hunter on foxtell now ?? ?